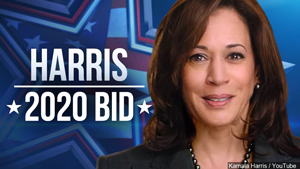 Sen. Kamala Harris came back to her hometown of Oakland, Calif., to announce her quest to win the White House and is the first candidate to enter a bid for the 2020 presidential contest. The Democrat, who is serving her first term in the Senate, spoke to some 20,000 people at a Jan. 27 outdoor rally. She promised to serve all Americans and to uphold the values of truth and decency. Her message delivered at city hall brought her back to the place where she started her political career as a prosecutor and then California’s attorney general. Next on her list was a Jan. 28 town hall meeting in Iowa aired by CNN as part of a visit to the important Democratic primary state. She is the daughter of immigrants from Jamaica and India and formally announced her campaign on Martin Luther King Jr. Day. She attended Howard University and stopped in South Carolina to address her sisters in the Alpha Kappa Alpha sorority. Questions have been asked about her time as attorney general and prosecutions and whether she identifies as a Black person in America or as an immigrant. Others appearing ready or already in the race are Sens. Elizabeth Warren of Massachusetts and Kirsten Gillibrand of New York, former Maryland congressman John Delaney and Julian Castro, a top housing official in the Obama administration and onetime San Antonio mayor. Others who may run include Sens. Cory Booker of New Jersey, Sherrod Brown of Ohio, Amy Klobuchar of Minnesota and Bernie Sanders of Vermont.